Whitney Moore (center) fronts Queen Bee and the Honeylovers. 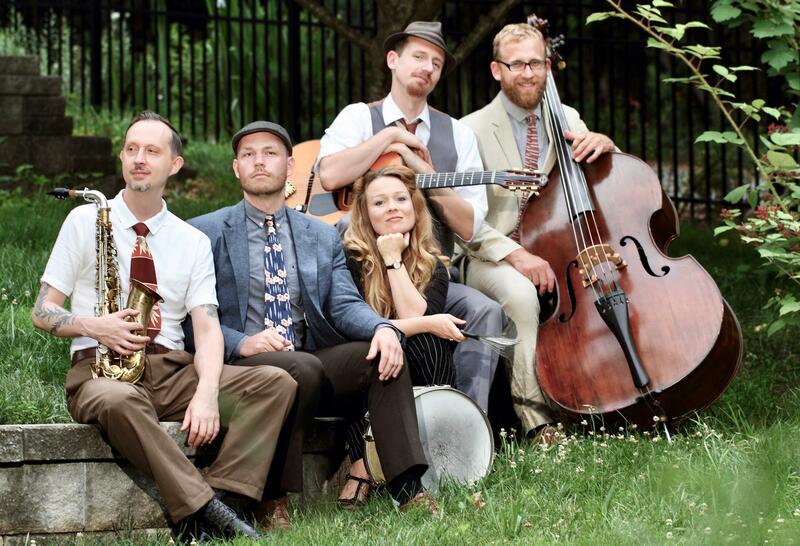 Moore’s new band is Queen Bee and the Honeylovers, and their debut album is simply titled “Asheville.” The music comes from personal and societal nostalgia for Moore, a fourth-generation native of Asheville. Queen Bee and the Honey Lovers celebrate their new album, “Asheville” with a performance April 27 at Isis Music Hall, in Asheville. Moore grew up in a musical family—her father still sings and plays drums. Moore lived in Spain in her early 20s and, later, in Mexico, grounding her in Spanish, Latin and flamenco music. Over the years, Moore has suffered five bouts of typhoid. The most recent of which robbed her of her singing voice for a year. That episode and the tug of family brought Moore back to Asheville eight years ago. She joined a flamenco group here, but that group disbanded around the time her son was born, at the end of 2016. For reasons she’s only beginning to understand, the confluence of those events drew Moore to the dawn of jazz. Moore wrote stories as songs, narratives drawn from Appalachian folklore and personal history. “The Legend of Zelda Fitzgerald” is a mirror for Moore’s own marriage and the postpartum depression she experienced after the birth of her son. “I felt a lot of connection and kinship with women in the past who were pathologized and committed to mental hospitals,” Moore said. “As I was studying a lot of the characters here from Asheville back in its golden era, back in the jazz age, (Fitzgerald’s) story really jumped out at me. I could really see myself in her. “Logan and Moore” is about her grandfather’s tailor shop on Pack Square. “Beacham’s Curve” recalls her grandfather’s experiences riding the trolley. And “Helen’s Bridge” is drawn from a legendary Asheville ghost story. Moore is also deliberate about singing in a style reminiscent of the era—borrowing qualities she found in the voices of Billie Holiday, Ella Fitzgerald, Blossom Dearie, Erykah Badu. More than a sonic callback to yesteryear, Moore sees her music in a contemporary social context.